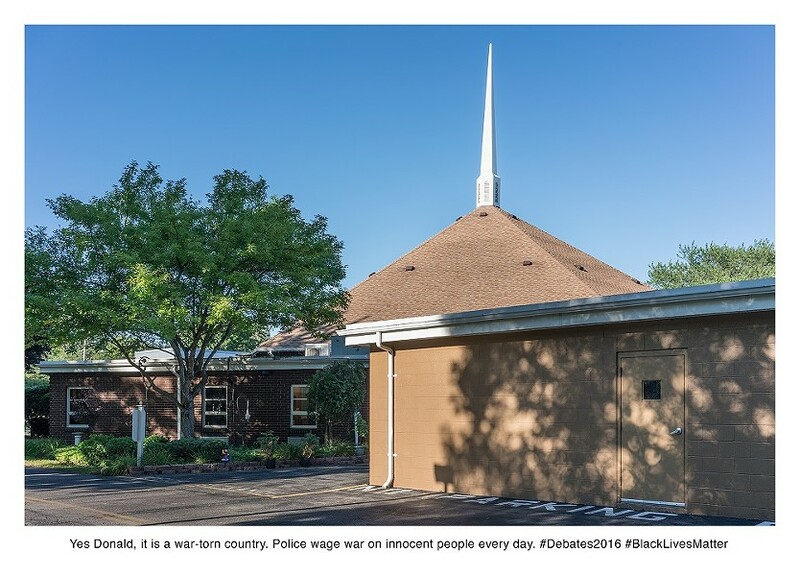 Tuesday through Saturday, 10 a.m. to 5 p.m.; Sunday, 11 a.m. to 5 p.m.
A tweeted epiphany about taking a stand in a divided country, paired with an image of the location the tweet was sent from. Someone once described Twitter to me as a space where, unless you're a celebrity, it's like being in a room full of people and just talking to yourself. While it may take a lot of hustle to gather an audience on that particular platform, using hashtags is a way to add your voice to something larger than your own personal platform. Hashtags create "trending" bits of information, spreading news and ideas like wildfire, and can generate crowds behind social movements. It's a way that everyone can participate in a discussion, adding content to the cresting wave of a social or political moment before it slips back into the greater, chaotic sea of media. While movements might lose momentum, evolve, or fade away, the flurry of voices surrounding them remain in that strange digital realm, and are summonable with the right words following a tag. These digital traces are central to the work of art collective Larson Shindelman, whose Rochester-focused social media project "#LarsonShindelman #Mobilize" is currently on view at George Eastman Museum. At first glance the photo installations in Eastman's Project Gallery seem like non-sequiturs. 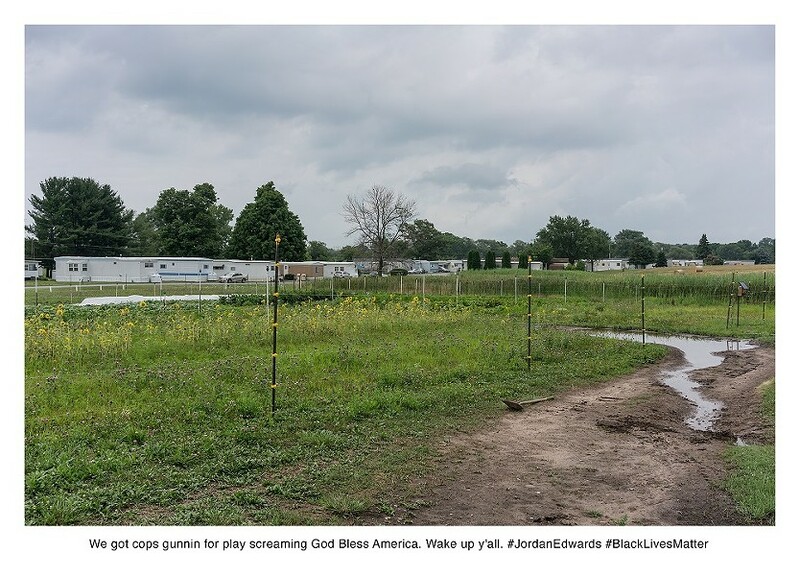 The large inkjet images of unpopulated sites, including houses, parking lots, and empty downtown streets, are each paired with short, gutting statements about various pressing social justice issues, peppered with the relevant hashtags: #Charlottesville. #SandraBland. #MeToo. #BlackLivesMatter. 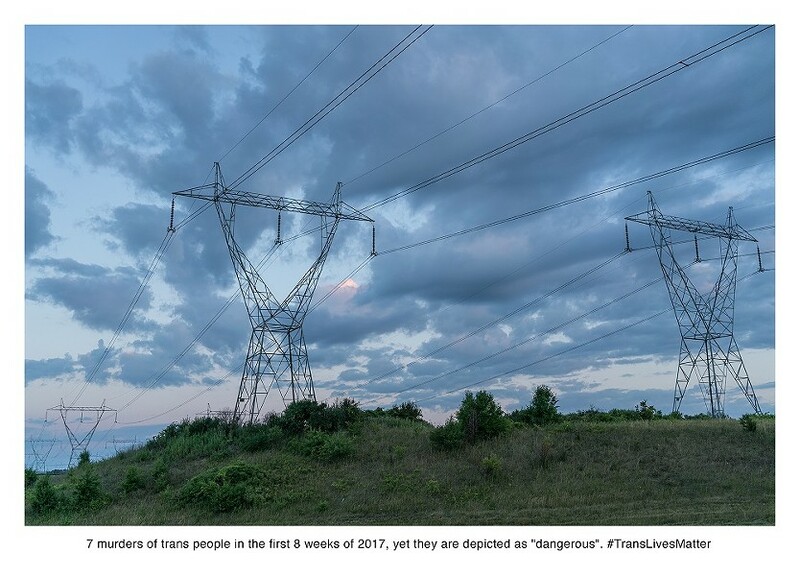 #TransLivesMatter. #PhilandoCastile. Roadside rhetorical question: who does the second amendment protect? 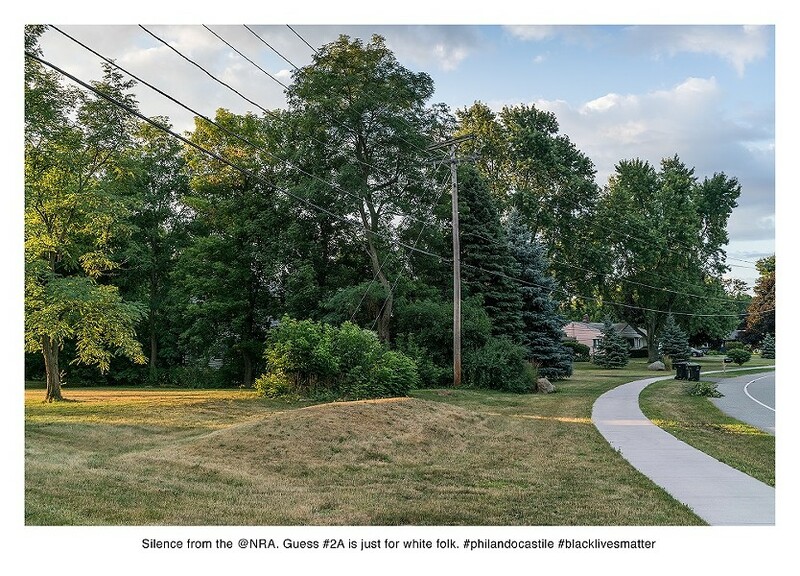 Eastman Museum invited Nate Larson and Marni Shindelman to create this new work as an extension of their ongoing series "Geolocation." 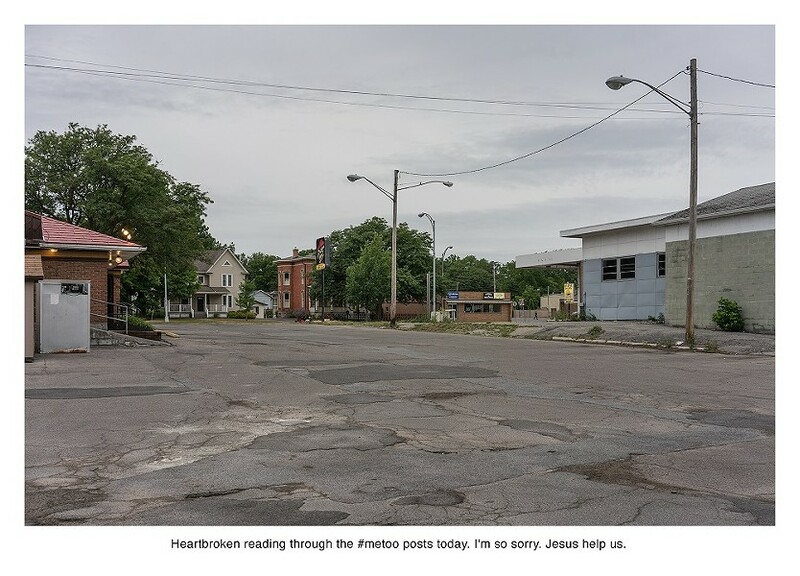 In this series, they use GPS information embedded in social media posts, travel to the location where each post was made, make photographs at the location, pair the image with the tweet, and create installations and exhibitions related to social issues in cities around the US and the world. Larson, who is based in Baltimore, and Shindelman, who is based in Athens, Georgia, traveled to Rochester in July 2018 to create this arm of their project. Shindelman teaches at the University of Georgia, which is part of a research consortium with the University of Kentucky, where there's a lab called Digital OnLine Life and You (DOLLY). "They're tracking all of Twitter, they're basically just pulling everything down," Larson says. "And one of the research assistants was really generous with us in sharing that data, and we could give him geographic parameters. We wanted to look within 60 miles of Rochester, and we were looking specifically for different hashtags that were used to organize around social justice themes." A message from the margins. Larson and Shindelman were given a massive spreadsheet with thousands of tweets, which they combed through to identify ones that interested them. They filtered out tweets that used social justice tags to promote racist or misogynist ideas. "We wanted to lift up voices that we thought were important and remember this moment, and how these voices are using this medium to organize around these themes," Larson says. "Once we identify a list of tweets we're interested in, we drop it on a Google map to see where they cluster. You start to get a sense of some people's routine over time. We don't talk to any of the users. It's more about this moment in time than it is about interacting with a specific person. But it's also about looking at the digital traces that get left behind." On April 29, 2017, 15-year-old Jordan Edwards was fatally shot by police officer Roy Oliver in Balch Springs, Texas. A tweet sent from this location in Rochester joined the national (online) discussion on the tragedy. Meeting 45 on his favorite medium. The work in "#Mobilize" is drawn from about five years of tweets, though no date or time stamps are included in the work. It's not hard to discern a timeframe for when some of the tweets were posted, though: an image of a small garage on a bright day includes the words "Sandra Bland would have been 30 years old today. #SayHerName #itMatters." 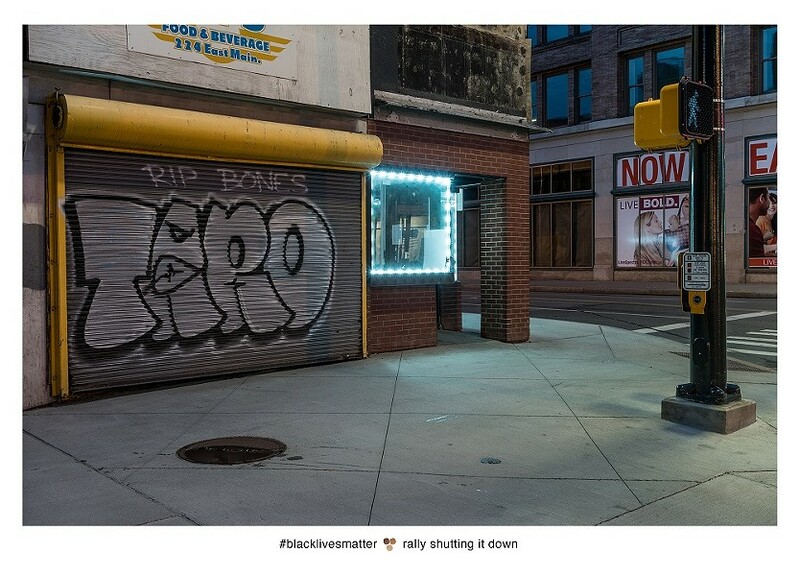 Another image, a night shot of a corner at East Main Street, is paired with "#blacklivesmatter rally shutting it down." The stillness in the image is eerily at odds with the scene of the July 2016 rally at which protesters held the streets, before police in riot gear arrested more than 80 people, including two black reporters. 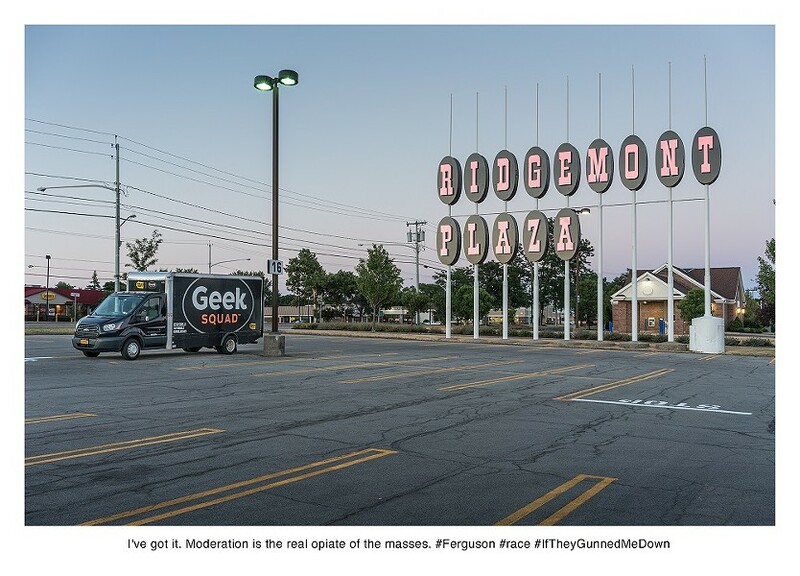 Two years after this tweet was posted, Larson Shindelman photographed the location where the Twitter user stood — the eerily clear streetscape a far cry from the activity of the rally. In a way the images serve as visible echoes, bouncing against the surfaces of the sites where the person who tweeted stood. Not every instance of tweeting something crucial took place in a setting of actual protest. More often than not, the person was going about their day and posted something about what was weighing on their mind, likely invisible to everyone around them. Sharing a hashtag with many #MeToo testimonials, a tweet expresses empathy for the masses impacted by assault and harassment. Presumably scrolling through social media while at this location, the person who posted this was struck by the scope of the problem. A bleak quip for a bleak situation. 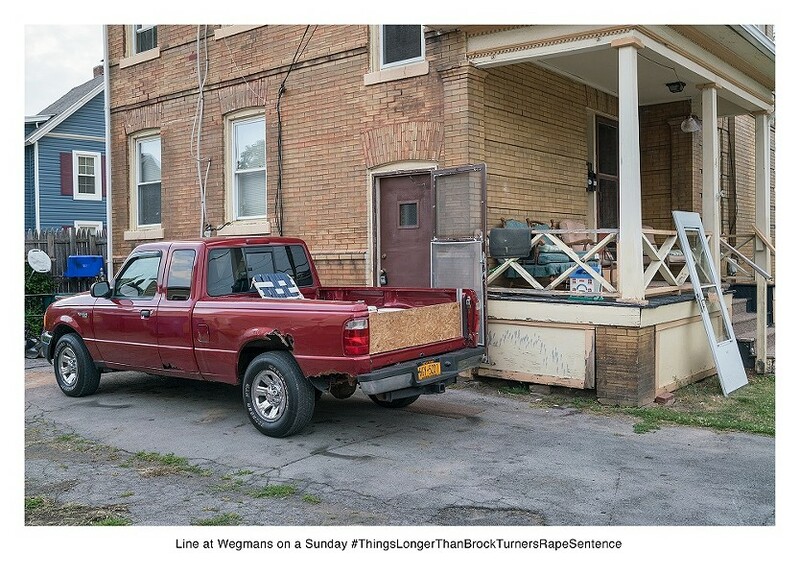 An image of a pickup truck parked at a home is paired with "Line at Wegmans on a Sunday #ThingsLongerThanBrockTurnersRapeSentence" — a darkly snarky comment presumably whipped up after a shopping trip. 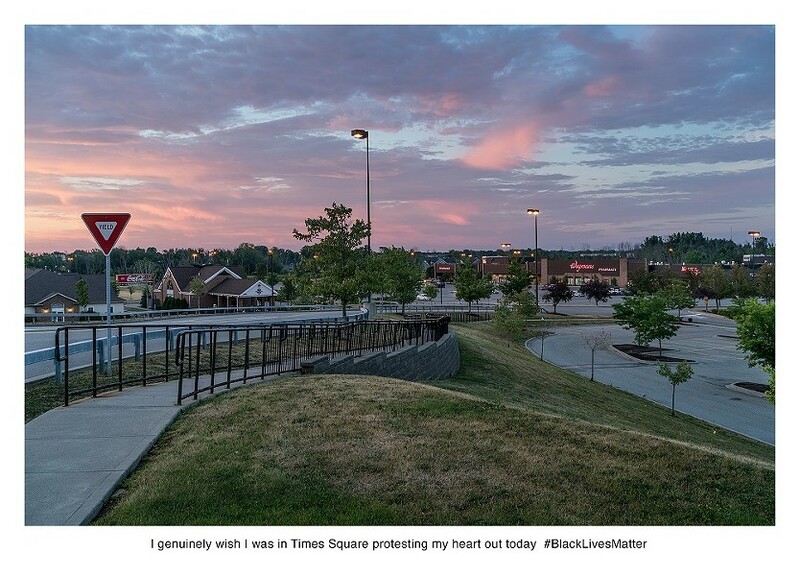 In another image, a Wegmans parking lot was the site of someone posting their regret that they couldn't be in Times Square protesting with the Black Lives Matter rally. What looks to be a suburban street was the site of someone posting positivity about #BlackGirlMagic. Larson Shindelman's #Mobilize project reveals the heavy matters that weigh on the minds of many, even if they are unable to be physically present at a protest. Our hand-held devices have changed the way that we contribute our voices to virtual discussions, giving us access at almost any time and any place. The swarm of voices in movements like #MeToo and #IfTheyGunnedMeDown pursue justice like the Greek Furies, bypassing the traditional modes of disseminating information, with the potential to give media consumers a wider sense of the problems we face. Larson Shindelman's work forms a record of what could be called a new, digital-based version of "A People's History of the United States." 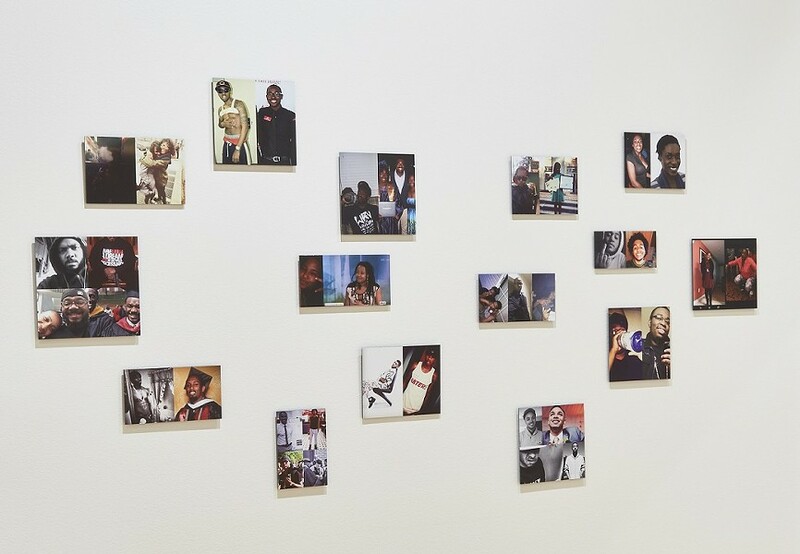 Installation view of "#IfTheyGunnedMeDown," at Eastman Museum. Larson Shindelman collected images that POC posted to reveal their different facets and criticize which side of them the media would choose to show if they were killed by police. "#LarsonShindelman #Mobilize" is on view through May 26 at George Eastman Museum, 900 East Avenue. Tuesday through Saturday, 10 a.m. to 5 p.m.; Sunday, 11 a.m. to 5 p.m. $5-$15, 327-4800; eastman.org.